Magnolia CMS is a great product to develop enterprise websites, extranets and intranets. At the moment, the community is growing day by day but so far not many extensions are available. Magnolia is an enterprise CMS, the initial learning curve takes time, to learn all its functionalities and how to customize it is necessary to know Java. When one wants to develop just a simple website without complexity which doesn’t need any specific features such as workflow, versioning, environment separation between staging and public, etc. it is preferable to choose another CMS. The usability of Magnolia is appreciated, a content editor easily learns how to manage the content in two hours only. Magnolia is open, flexible and extendible and it is possible to modify or improve the standards features. Using Java API, REST, SOAP, CMIS, XML, etc. makes it possible to integrate other software or legacy data. Magnolia as a modular architecture, a module has its lifecycle, configuration, version handing and dependency: this is a good approach for package content and functionality. Magnolia is written in Java, the platform of choice for enterprise IT systems. It is scalable, stable and secure, and Magnolia separates the staging from public environment. Account support is limited on the Cloud Professional plan and requires you to purchase support tickets for the smallest issues, whereas other providers usually provide basic support free of charge. Acquia is very expensive, so unless you're an enterprise level partner, then it is likely out of your budget. The online documentation could use a refresh in design and can be frustrating to search through for answers. Fast, reliable and tailored to Drupal. Next version seems to be largely improved, but managing the update will be challenging. I think that a big company needs a CMS like this for their websites. Also it is always good to have a CMS that gives you also the possibility of managing the publishing for different devices like in V5. 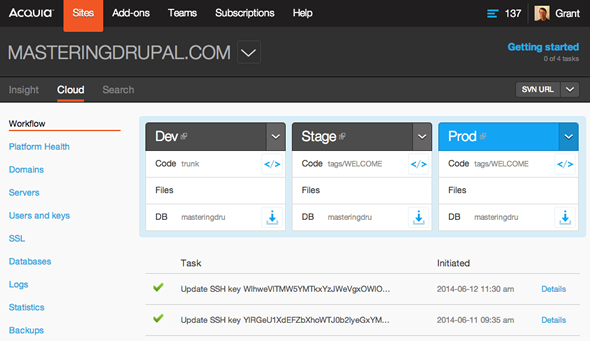 Acquia is a leader in managed Drupal hosting, knowledge and supporting infrastructure. It is open source and Java based. They are the major consideration and it has an open community to support. We can find answers easily. Also since top users are using it - that give us confidence to use it. It is a Java purely based framework and developers can easily pick it up and use it. We are happy to have selected it.